TotalProtect Home Warranty is a subsidiary of Cross Country Home Services, which was founded in 1978. TotalProtect is a home warranty provider to homeowners around the nation. TotalProtect Home Warranty is a nationwide provider of home warranties, which means pricing and coverage may vary depending upon the regional location of the purchaser. The company offers three types of plans, and included in all of them is unknown pre-existing condition coverage, and rust and corrosion coverage, both of which are not usually offered in plans from competing companies. Plans also include coverage for items that are still under the manufacturer’s warranty. The Appliance Plan includes the kitchen refrigerator, including built-in ice and water dispensers, cooktops/ranges, wall ovens, range exhaust hoods, built-in microwaves, built-in trash compactors, dishwashers, and clothes washers and dryers. The Systems Plan covers garbage disposals, air conditioning and heating, plumbing, electrical and gas systems. The Combo Plan includes coverage for everything listed in both of the plans detailed above. Purchasers can also choose optional coverage for pools and spas, and Combo Plan policyholders get a homeowners’ insurance deductible reimbursement. 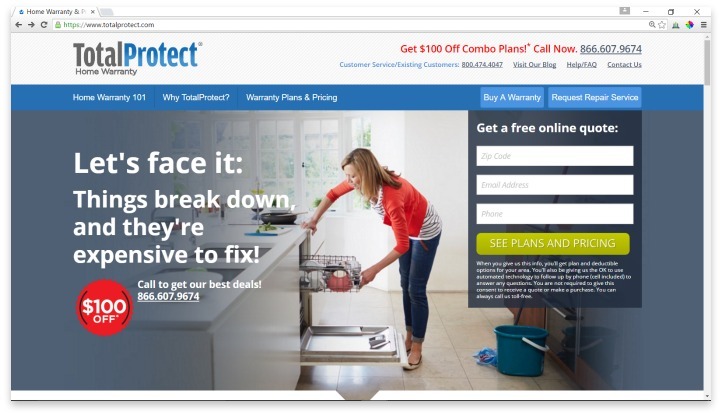 TotalProtect policyholders get free membership to Appliance Buyline, a source that allows members to get special pricing on brand-name appliances for upgrades and replacements. When a covered appliance or system breaks, the policyholder can call the TotalProtect hotline, which is available 24 hours a day, or plaice a claim using the online form. TotalProtect then provides a service professional to diagnose the problem. At the time of appointment, the policyholder pays a deductible that is determined by their premium. TotalProtect then decides if the item should be repaired or replaced. If it needs to be repaired, it will either be done that day, or at a future date if parts need to be ordered. If it needs to be replaced, TotalProtect will pick a replacement item, but it is not guaranteed the policyholder will get the same model. Policyholders can take a cash payout, but it will most likely be lower than the cost of the new appliance or system. TotalProtect Home Warranty utilizes a grading system to ensure the contractors they use provide quality workmanship and convey professionalism. The company calls it the Dynamic Vendor Rating system, and it rewards their top service providers, which incentivizes customer satisfaction. There are also dedicated service managers that oversee all the pre-screened and licensed contractors in the network, which is rare in the home warranty industry. Furthermore, repairs are guaranteed for 180 days. Overall, most consumers report satisfactory experiences with the claims process., stating it’s simple, fast, and the service providers who entered their homes were professional and competent to perform the job. However, there are a small number of complaints that highlight unprofessionalism from individual contractors. For example, some didn’t complete their work, were late for appointments, or didn’t return phone calls. TotalProtect Home Warranty offers three types of plans, and included in all of them is unknown pre-existing condition coverage, and rust and corrosion coverage. TotalProtect goes out of their way to appear trustworthy, putting systems in place that keep contractors in check, and it seems their appearance matches up with their reputation, for the most part. They offer some key incentives with their plans, like coverage for unknown pre-existing conditions and rust, which is pretty much unheard of in the industry. As far as home warranties go, TotalProtect Home Warranty offers comprehensive plans that people can count on. Have you had an experience with this company? Please share your TotalProtect Home Warranty reviews below. TotalProtect Home Warranty is a nationwide provider of comprehensive home warranties.